Hard Tops of Northern Colorado has been serving Fort Collins, Greeley, Loveland and surrounding Northern Colorado areas since 2005. We provide quality refinishing and remodeling products and services for residential and commercial clients. 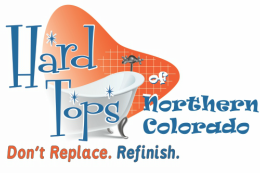 Hard Tops of Northern Colorado offers quality products and guarantee exceptional service and proper installation. ﻿Our refinishing products and services provide an attractive, cost effective alternative to replacing your existing countertops, showers, bathtubs and more. Preview our gallery for inspiration for your home or business for more ideas.